While I am getting the shed ready for the new layout (see my post at MRCS for details), I have been thinking about starting on building some of the structures for the Donner Summit layout. In this entry I will talk about going about the flat I am going to build to represent the structures in downtown Colfax. In the Google satellite map to the left of N Main St the is the row of buildings I want to model. These businesses will make a perfect row of flats. I plan to build the models of buildings as fronts right against the backdrop. The sidewalk and street will be modeled also. In this picture, the railroad is the brown line running on the right side of the image from top to bottom. 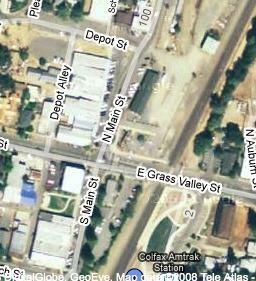 The old freight station is north (above) of East Grass Valley St and to the east (right) of N Main. The depot is just off the bottom of this image on the east (right) side of the tracks. 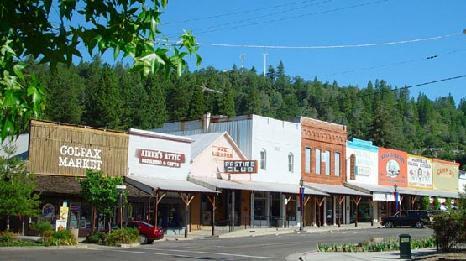 One really cool thing about Colfax is that it has changed remarkably little over the years. 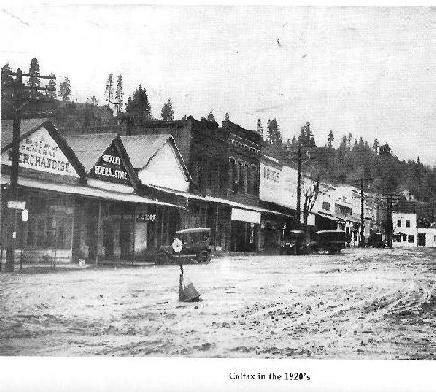 In the two photos to the right you can see Colfax as it was in the 1920's in the upper, black and white photo and in the twenty first century in the lower photo. Most of the buildings are the same. There has been a roofline change on the first and second storefronts on the left, the signs have changed, and some paint jobs have changed, but otherwise, it looks remarkably timeless. The parked cars are the best indicator of the time. This works really well with my idea of having a layout that I can 3 sets of trains representing 3 time periods on the storage tracks. If I want to operate Donner in the 1950's I will have trains with cab-forwards and F3's on the front. The 1980's will have SD45T2's and GP35's and for the modern day I can have UP AC44CW's and SD70's pulling auto-racks over the summit. I have 6 staging tracks in the basement but each track will be long enough for 2 or 3 trains to be cued up.